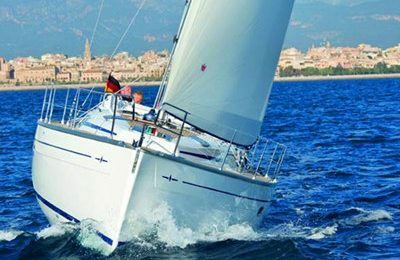 Charter this spacious 36′ catamaran sail yacht out of Barcelona, and sail away to the fantastic Balearic islands. The 2008 36′ sailing catamaran yacht is from French yacht builder FOUNTAINE PAJOT. This fine yacht comes with a spacious cockpit entertainment area, a well designed working kitchen,and a comfortable dinning area with 360 degree of ocean view, When you walk down to the front deck, there is a big sized trampoline, great for a sun bath or just relaxing. The yacht holds up comfortably up to 12 Adults during the day, or 6 for over night,and comes with full kitchen and 3 sleeping quarters, 1 restroom. Ideal weekly yacht charter route is to sail over the Balearic sea coastal and the islands. Base price includes 7 days bare yacht rentals with insurance and VAT, tax, basic linens and a tender. 36′ FOUNTAINE PAJOT Mahe sailing catamaran, 3 double sized sleeping quarters, 1 head, hot water maker. 2x Volvo-Penta D1-20 19hp Sail-Drive . Tank content: 240 l .
Holding tank (disposal via seacock). 2 insulated cooling boxes with electrical refrigeration 12 V.
Complete crockery, tools, coffe maker, pots, complete sets of knives, forks, etc..